Jane and Paul had been and were living together in St. Johns Wood the entire time I was in London. She was on a sort of vacation until the Fall. She had been back from her tour of the States for only a short time when I arrived. She had been away some five months. A long time. According to the Biography she admitted that things were quite different. Paul had discovered LSD and there were strange people going in and out of the house constantly. I personally never saw that many strange people though I admit I wasn't around every day. The only weird incident was the one night John came rather drunk. Another was when "Mama Asher" (as Jane's mother was called), nearly drove down Paul's gave with her Mini Cooper. She was quite a terror. Paul's house as a regular United Nations Social Center and the people standing around the front gate would pass the time rescuing Jesus the kitten who always scampered under the gate. Thisby had three kittens altogether--Joseph, Mary, and Jesus. Then there was dear Martha. Somehow I think Paul was using Martha as a child substitute and I wrote that in a letter home even before Francie S. ever came to the same conclusion. Downstairs alone he had at least five television sets. Most not working properly. things were rarely neat in that house as there were so many items to sort through. The Fool had also done some work for Paul: one of his guitars, a small mural of a forest, rainbow, and birds painted on one wall and even then there was a photo painting of a green apple hung up, across it were words in Dutch. Also, don't think that George is the only one of the four to own a sitar. Paul had one too. Upstairs looking at the house from the outside; the first window starting from the left on the second floor in the bathroom and the next two are Paul's bedroom. Inside the room beneath these two windows was a large, long dresser of beautiful pine wood. The bed then was king sized with a royal blue spread. The rug was dark blue wall tow all and the closet was gigantic. Going back into the hallway and past the Mahogany rail, you find the guest room. Smaller than the other, and at the time it was done in purple and black. The two bathrooms: one in blue and white and the other in a deep red and white had sunken bath and shower. The room at the top was a workroom and a recreation room, at the time, there was a piano in it, and Brian had casual meetings there. I think it's a nursery now for Mary. The backyard was small compared to the other Beatle homes, with a patio (it was then only slightly overrun with weeds) and the Alice in Wonderland statues were a present from Michael, who I met only once. He had just quit a job for some studio and was occupying himself with a pack of Tarot cards. He's quite funny and I like the Scaffold records a lot. I think they deserve much more airspace. In August during the building of the famous Dome in Paul's backyard, he said that the original concept was that it be a place where no words were to be spoken; a place to be a peace. It didn't really work out exactly like that, unfortunately. He left to visit Liverpool for two weeks, and to get away from the noise of the builders. Afterward, he mentioned that he had hit 140 mph going up. Paul is beautiful. His eyes are truly the windows to his soul. The most diplomatic and charming person I've ever met. It's easy for him to cover his true feelings. Still, if you look well you can see the truth in his eyes. I could listen to him talk for hours and does he ever love to talk! The thing about him is that he's truly interested in finding out at least a little about everything and everyone. He adapts to things quickly, and you can't help but constantly smile when he's around, even feeling the butterflies in your stomach. The first time he ever really looked at me, he really looked at me! He was walking and in mid-stride must have noticed from the corner of his eye, me standing there like I was almost suspended in animation. He didn't look at anyone else though there were five or six of the English girls behind and around him, and previously it seemed he had been thinking about someone quite seriously. He was alone. He took me in with one long glance, and I'll remember the sensation I felt then all my life. It was like every cell in my body was being charged with electricity. Then his eyes fixed o mine and locked there for what seemed like an eternity of vibrations thought it could have been seconds. Then I smiled because I felt my head would burst and he smiled. I still have the feeling that for that instant in time he was reading my mind. I must have turned at least slightly pink although Judy said I actually turned a shade paler. The saddest I ever saw him was the night he drove back home with Jane and a friend from Bangor, Wales after Brian had been found dead. Both Paul and Jane's eyes were red from crying. I do believe that he and Paul were close. After India and Jane, he went through some very trying times and several girls. The three noteworthy ones were Peggy Lipton (who had met in '64), Francie Schwartz and Linda Eastman See (now McCartney). I have never met Linda personally although I have written to her and received a very appreciated and nice letter sent as thanks from Paul through Freda in Liverpool. I can only say that I know Paul loves his whole family very much, no matter what some people may say or what had gone before. Interesting story! I have known these two photos since they were taken, of course I can't remember which of my friends took them. 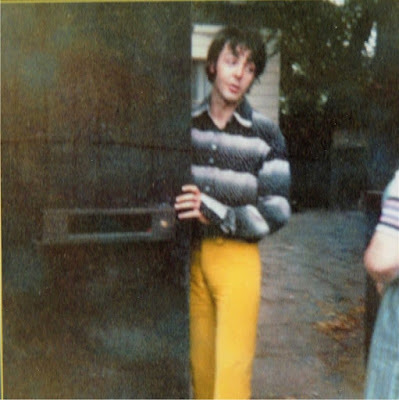 I believe the fan Paul is talking to on the top photo is British Paul fan Anne. Did Tia Cash say how she knows so much about the inside of Paul's house? Did he invite her in? Interesting anyway. The stories don't go directly with the story. 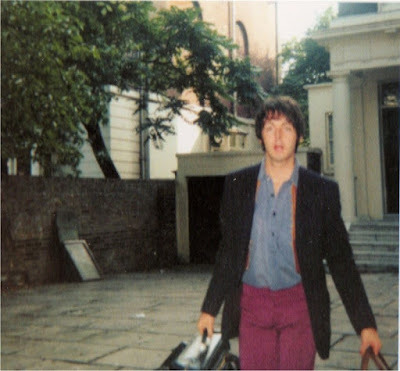 I just used them to illustrate what Paul was looking like in the summer of 1967 at his home. I believe the friend named "Judy" is a friend of yours? I think you mean 'photos' instead of 'stories'. Yes you are right. I have been so tired lately that I am surprised that I haven't made more mistakes. oops. I'm also curious about how she knew so much about the inside of Pauls' house. As Jane Asher was living there with Paul, it was as much her home as his. I wonder how she felt about these fans looking at many of her belongings (possibly being nosey as well). Was the silver tea set really Paul's or was it hers? I felt sorry for Jane in all of this. I don't doubt at all that Paul loved his family but the writer's last comment about "what had gone before" was weird, as if only she had some special little insight into him. I would say Jane Asher understood Paul McCartney far more than all the Francie Schwartzs and fans put together. Because she has never spoken about Paul, Jane is portrayed unfairly by some as never being "there" for him. Only she knows and she's not telling. I have quite a few of these "Beatles rule" newsletters and I am hoping that more of this fan's stories are in them so we can learn how she figured out so much about Paul's house. Did she sneak in? yes, HOW did she know so much inside Cavendish?